LOL xiaomi have made competition on their own lineup who will have Redmi Note 7 Pro if there is Poco F1/F2? Kangal, 04 Feb 2019A single front-camera is nothing to be ashamed of. And Samsung says the Note8 has stereospeake... moreAre you a Note 8 owner? Maria, 04 Feb 2019In Samsung's Term, Note series is not their flagship although the Note series may have complet... moreMore like a uber flagship, since Notes are priced higher than their contemporary S series, and has additional features such as S Pen. In Xiaomi's lineup, the equivalent is probably the Mix series. For example, Mi Mix 3 is priced higher Mi 8 and has additional features like wireless charging. Samarth N8 808 user, 04 Feb 2019I just didn't understand the concept. If Redmi is going big time, then what about Poco and Mi... morei guess the mi will focus on flagship, redmi for midrange, and poco for bottom feeder.they might develop similiar main hardwares, eg: cpu-gpu, ram, and storage, but with different bell and whistle packages. Rex Tech, 03 Feb 2019Man,the quality of that picture reminds me of the horrible Sony phones had back in 2012.There ... moreTaking a bad photo with a good camera is easy in the "right hands". A photo blown up from 500x378 to 728x546 from social media isn't exactly ideal for judging a camera's performance. You can also find it here, still at a very low resolution, but much better than gsmarenas upscaled version. Better to compare under similar circumstances by photographers with similar skillset. Look at the fish in the bottom right corner, look at spongebob, the donkey etc. The Redmi is miles better. Accurat colors and incredible details in the texure of the fabrics etc. You can look at the same thing as mentioned above, but also in particular the bus route. Trolling about the Redmi Note 7's camera won't get you far when it's so easy to prove you wrong. Poco was just a test of whether people are willing to buy crippled "flagship". I believe that Redmi will replace Poco and will release such device in the future, it will be good for the price but not the best. It is going to be the same like in Huawei vs Honor. Honors View 20 cant compete with Huaweis Mate 20, I cant say the phone is bad but a lot of features are missing. I just didn't understand the concept. If Redmi is going big time, then what about Poco and Mi series? Do they plan to have ads in the SD855 phone, to make it further cheaper? Or is their plan to have a small sized flagship? What is going to be the different factor, compared to, say Poco F1? Or will it be, as a replacement to Poco F2? Dan, 04 Feb 2019My Note 8 has a single front camera and no stereo speakers. Read the post I was responding to first.A single front-camera is nothing to be ashamed of. And Samsung says the Note8 has stereospeakers (uses 1x loudspeaker and compensates a little with the earpiece), though I wouldn't call it that. And yeah I read the comments accurately, hence why I showed you how the Note8 satisfied at least 5 of the properties. It only seems to fail 1 property, which I agree on. So if you're only contention is the loudspeaker performance, then most phones will not be flagship anymore. Seems like only 1x flagship was released in all of 2018 and that's the ASUS RoG Phone. Dan, 03 Feb 2019So my Galaxy Note 8 is not a flagship?In Samsung's term, the Note series is not their flagship although note has everything. Kangal, 04 Feb 2019Wait, what? Did your Samsung Galaxy Note8 come with an LCD screen, no NFC chip, no OIS, a v... moreMy Note 8 has a single front camera and no stereo speakers. Read the post I was responding to first. So typical. What everybody really wants is to built a flagship, always. Xiaomi created Poco. Poco built a flagship- at least at the chip department. Xiaomi created Redmi. Redmi is supposed to build up to mid-range phones. Yet, they announce that they also want to built a flagship Phone, probably only at the chip department, so they leave Xiaomi's Mis in peace. I do not find it very smart to have a flagship chip surrounded by non flagship-grade components. Good news for Qualcomm anyway, selling their most expensive chips is good for them. Dan, 03 Feb 2019So my Galaxy Note 8 is not a flagship?In Samsung's Term, Note series is not their flagship although the Note series may have complete package. The Note is categorized in the phablet (phone tablet, if I am not wrong). The S series (not the lite one, as S10 family have) is the flagship of theirs. I think Xioami has the same/similar term. Mi series is their flagship, not Mi Note. Dan, 03 Feb 2019So my Galaxy Note 8 is not a flagship?Wait, what? Did your Samsung Galaxy Note8 come with an LCD screen, no NFC chip, no OIS, a very bad camera, and No Ingress Protection? If true, yes your phone isn't a flagship... but I have bad news to share, your phone is a knock-off/fake. So his point stands. A flagship device is either a "No Compromise" device, or it is a device with "New Features, with Low Compromise", and both found at the High-End price points. For instance; a OnePlus 6t is not a flagship phone, but a Samsung Galaxy S9 is. And a Xiaomi BlackShark Helo is not a flagship phone, but the ASUS RoG Phone is. Now they keep going. Other phone makers should be worried especially those overprice like samsung, apple, etc. 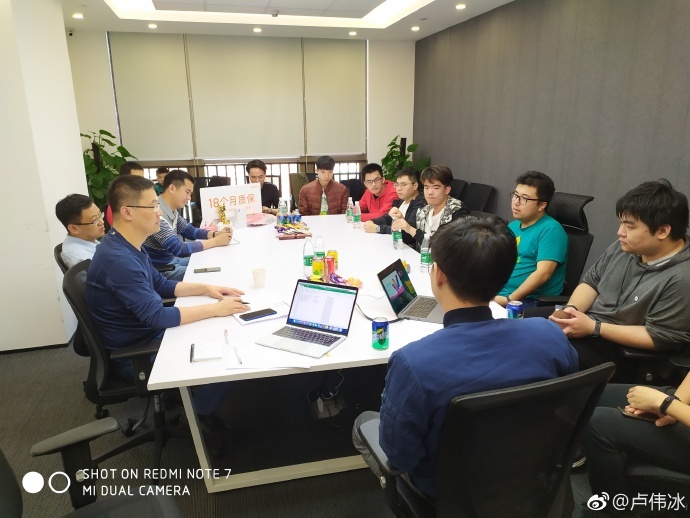 Ray, 03 Feb 2019A nice photo.. A meeting to discuss about what to copy and from which manufacturer. So similar to a meeting at any other phone maker then, since they've been copying each other since before Xiaomi even showed up on the international stage. Maria, 03 Feb 2019When it has no NFC, OLED, stereo speaker, more than 1 front camera, the best camera lens with ... moreSo my Galaxy Note 8 is not a flagship? Anonym, 02 Feb 2019It's not, as you can clearly see MacOS running Microsoft Excel on the left. Do have in mind Mi... moreFor me its too small to exactly see. So i can only guess.